Definition at line 38 of file multicast-strategy.hpp. Definition at line 40 of file multicast-strategy.cpp. Definition at line 59 of file multicast-strategy.cpp. 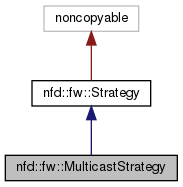 Definition at line 66 of file multicast-strategy.cpp. 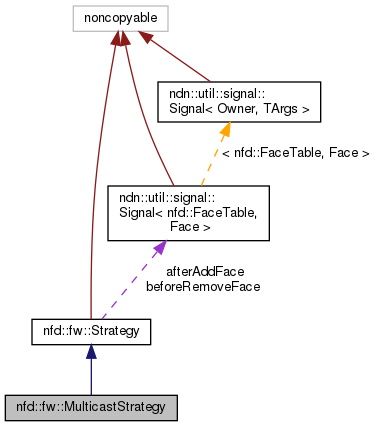 References nfd::fw::RetxSuppressionExponential::decidePerUpstream(), nfd::fw::FORWARD, nfd::face::Face::getId(), nfd::face::Face::getLinkType(), nfd::fib::Entry::getNextHops(), nfd::fw::RetxSuppressionExponential::incrementIntervalForOutRecord(), ndn::nfd::LINK_TYPE_AD_HOC, nfd::fw::Strategy::lookupFib(), NFD_LOG_DEBUG, nfd::fw::Strategy::rejectPendingInterest(), nfd::fw::Strategy::sendInterest(), nfd::fw::Strategy::sendNack(), ndn::lp::NackHeader::setReason(), nfd::fw::SUPPRESS, and nfd::fw::wouldViolateScope(). Definition at line 115 of file multicast-strategy.cpp.